Launching an online business can be, simultaneously, one of the most exciting and overwhelming ventures of your entire life. Because putting a website up forces you to not only dig deep and clarify who you are and what you’re offering, which can bring up a whole slew of your personal fears and insecurities to deal with. But it also can create a pile of technical challenges that can either inspire you or bury you and stop you cold. 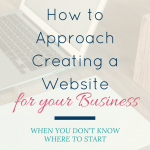 Rather than having the hurdle of building a website halt your dreams, figure out the best way for you to tackle getting your online presence and your dreams out there. First, let’s define each of these options. This happens when you contact several web designers, meet with them, and hire one to build your site. There are thousands of designers out there with differing design and work styles. 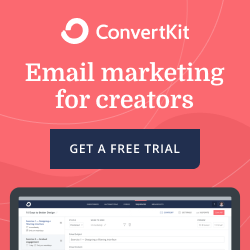 If you go this route, you’ll hopefully have a wonderfully satisfying experience and end up with a gorgeous, uniquely you, custom site that is optimized to convert your visitors to customers. This is a unique option that I developed while talking to potential clients who wanted to build their own site and had even tried to build it but got overwhelmed and frustrated with the process, so they ended up either not having a site or being embarrassed or beyond frustrated by what they’d created, or failed to create. A website coach works closely with you to teach you how to build your site. We go through site structure, basic branding, how to write all of your web copy, designing your site, building your site, and launching your site. There are so many elements that go into creating a gorgeous AND functioning site that works for your business. 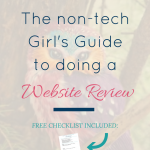 As a website coach, I hold your hand, walk you through the process, check all of your work, and jump on the back end of your site and help you with the tech if you get stuck. This process also really forces you to clarify your entire business, which is much easier to do with a neutral coach walking you through the process. 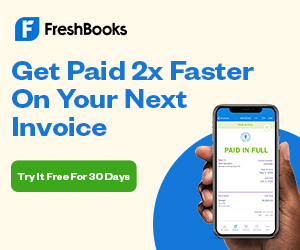 If you’re super comfortable with tech and are familiar with the basics of launching an online business, this is a good option. There are tons of templates out there, both free and paid, to help you get started building your own website, but you’re on your own in terms of figuring it all out and how it works together. 1) How comfortable are you with the technical aspects of building a website? a. I hate tech! It’s super frustrating for me!! b. Meh – I’m comfortable with it but don’t love it. Any option would work for you, though you might get frustrated with the DIY option. The DIY option will also probably take you a lot of time. c. I love tech, but I’ve tried to build a site and got overwhelmed and frustrated. 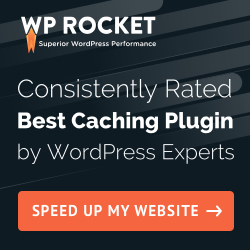 Website coaching is for you. A designer will take anywhere from 2-12 weeks, depending on the program/designer you choose. My custom sites generally take 8-10 weeks, though they can take longer. This timeline is generally dependent on clients getting assets to me ie. images and their copy. Those in my website coaching program take 8-10 weeks, though they can complete the program in as few as 4-6 weeks if they’re wanting to get their site up. DIY’ing your site can take anywhere from a few days to months. It really depends on how comfortable you are with tech, how complicated your site is, and how much you’ve already got prepped. The pieces that tend to take the longest are writing your copy, defining your brand, and actually building the site which can take a day or two to weeks/months depending on how complex your site is and how much you’d like to customize it. If your business is doing well and you’ve got some money to spend on it, hire a designer. Custom designs can run anywhere from several hundred to thousands of dollars. 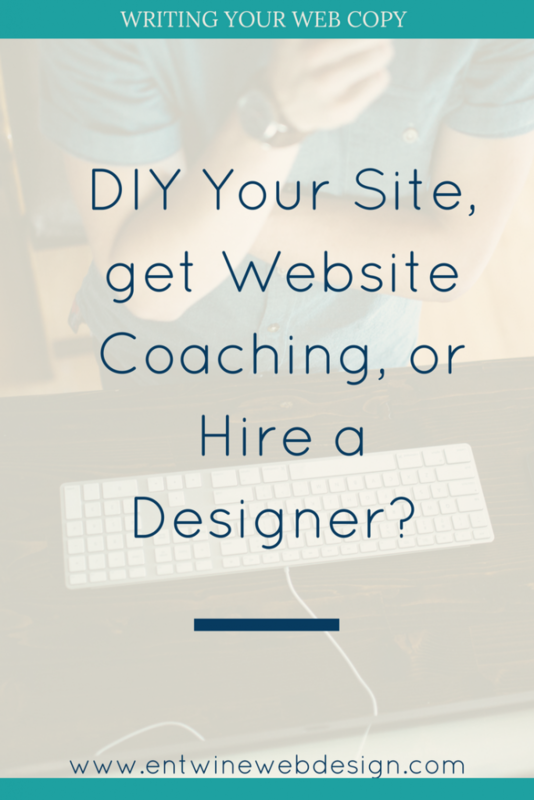 If you’re just starting out with a minimal budget, I’d recommend DIY-ing your site or hiring a Website coach. 4) What stage is your business? It’s probably time to hire a pro and get a custom site if your business is on fire and growing, you’ve “outgrown” your old site, or you’re wanting to add new offerings and more complex features to your site. If you’re just getting started, I recommend either DIY’ing it or hiring a Website Coach to help you out. 5) How important is being able to tweak/revise your site yourself? You’ll find that at some point, you’ll probably want to edit your copy, change out your images, or add additional information to your website. If you want no part of this, hire a designer who will either continue to make these updates or find a Virtual assistant who will do this for you. However, it might take a few days for these changes to happen as you’re dependent on your designer or VA’s schedule. Building your own site as a DIY’er or website coaching client allows you to have total access to your site. You know how it all works since you built it. If changing everything whenever the fancy strikes you is important, definitely build it yourself either with or without a website coach. Your website is an investment in your business and in this online world. You really do need a website for your business. However, you want to be smart in how you go about managing that investment. Let’s dig into the pros and cons of each of these and a few questions to ask yourself as you decide which route to take. you are in charge of your site and understand how to update your copy, change images etc. As I said in the introduction, putting up your website and getting visible can be a daunting task for many. There are so many moving parts that need to happen to get a website up and functioning: your message, offerings/services, products, branding, copy for every page, sitemap, business and website goals, the design and building the site itself. Once you’ve got all that, you also need email integration, automation sequences, social media integration, and SEO. Oh my. Many people do it on their own, and if you’re a tech ninja or you’re super familiar with how online business works, go for it. If you’re not sure what route to take and you want to talk to somebody, I’d be happy to chat with you, even if you’re not sure which route to take. Sometimes talking it out helps you get clarity, and I’m happy to help with that. 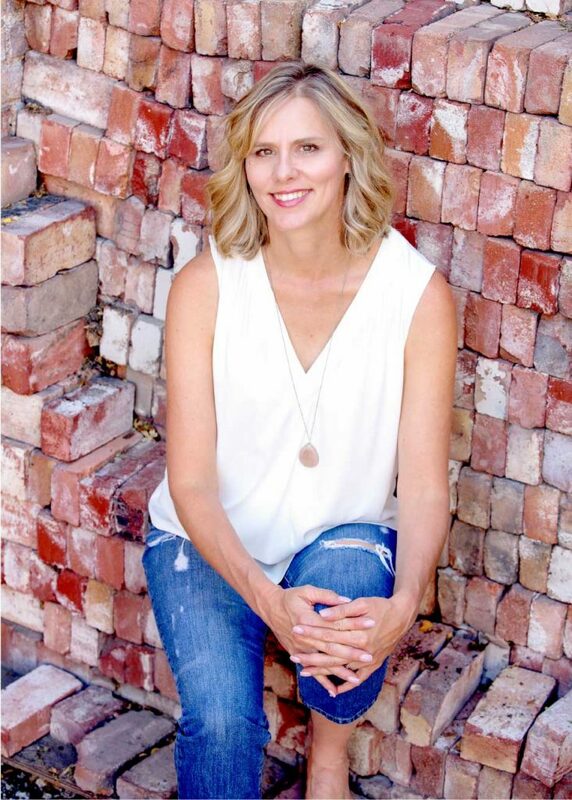 My mission is to support women in getting visible online and offering their amazing services to a global audience. Our battered world needs your gifts and your healing presence. Let’s get you out there.